First event – first win! The long journey to Barocca d’Alva in Portugal proved to be well worth the trip. 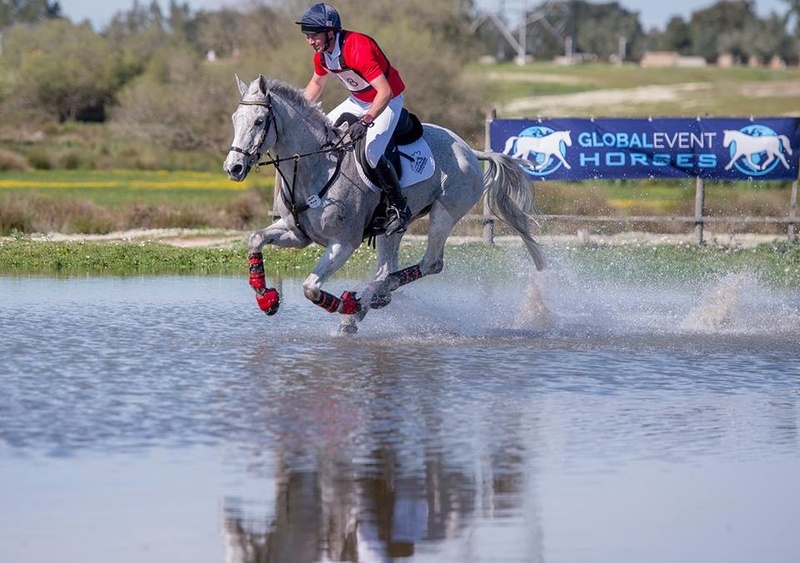 After a couple of days R&R David rode four horses in the CCI-S3*, the first event of the new 2019 season, and finished with a win with Jane and Ian James’ Eisfee (pictured) and 9th for Christine Lees’ Ferro Point. Eisfee‘s beautiful dressage put her just 0.2 points behind the leader overnight in the CCI-S3*. She took the lead with a quick and clear XC round, and a flawless show jumping round sealed the deal. Ferro Point meanwhile pointed her toes beautifully in her dressage test, skipped round XC and finished with a foot perfect lovely clear round SJ. Tim and Alice Page’s Dunges Don Perignon did a very consistent dressage and ran XC “cruising like a pro” despite losing a shoe immediately beforehand but was then withdrawn from SJ. Our fourth entry, Jane James’ Carneyhaugh Rua was in 15th after dressage and gave David “a strong ride” XC resulting in a slight diversion which picked up a few extra penalties (!) but was “clear and fabulous” SJ. The following weekend saw the team split into two competitions – Ferro Point ran in the CCI-L3* and a good dressage, only two time faults XC and another classy clear took her into 7th place. The other three were entered in the CCI-S4*: Eisfee was lying in 5th after dressage but a stumble in the water XC took her out of the running; Carneyhaugh Rua ‘s dressage test was ‘innovative’ – Jane James suggested David should get a 10 for keeping him in the arena! – and he ran clear XC but a few poles down SJ to finish 9th; and Dunges Don Perignon bounced back from his pulled shoe and tried really hard in his dressage, picked up a few time faults XC and jumped a beautiful clear round a tough SJ course to finish in 7th. A win and a further four top 10 placings – what a brilliant start to the season!